Phowa (Skt. utkrānti; Tib. འཕོ་བ་, Wyl. ‘pho ba) is the practice for directing the transference of consciousness at the time of death, either for oneself or another. The consciousness may be transferred to the dharmakaya nature, to a pure realm such as Sukhavati or to a favourable existence in the human realm. The practice is one of the Six Yogas of Naropa, but can also be found in many other lineages and systems of teaching, including the Longchen Nyingtik and Namchö cycles. Although it is included among the so-called 'five practices of enlightenment without meditation', it does require a thorough training before it can be put into effect successfully. Moreover, the teachings advise that phowa for others should only be undertaken by someone who has reached the path of seeing. Ordinary “phowa of three recognitions”: recognition of our central channel as the path; recognition of our consciousness as the traveller; and recognition of the environment of a buddha realm as the destination. 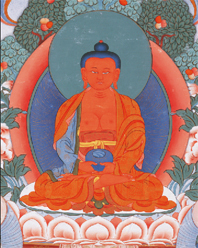 Tulku Pegyal Rinpoche was the first teacher to give Amitabha empowerments and teachings to the Rigpa sangha for the practice of phowa from the Longchen Nyingtik tradition. He did this on several occasions. Chagdud Khadro has also given the Rigpa sangha Amitabha empowerments and taught the phowa practice of Longsal Nyingpo on different occasions. Mingyur Rinpoche, Lerab Ling, 11-12 September 2010. [[Sogyal Rinpoche, San Diego, 2-4 December 2010. Sogyal Rinpoche, Kirchheim, 3-4 January 2011. Sogyal Rinpoche, Sydney, 22 February 2011. Garchen Rinpoche, Dzogchen Beara, 16 October 2011, Drikung Phowa Chenmo from the Drikung Kagyü lineage. Sogyal Rinpoche, The Tibetan Book of Living and Dying, Ch. 13 & 14. This page was last edited on 29 September 2018, at 03:34.